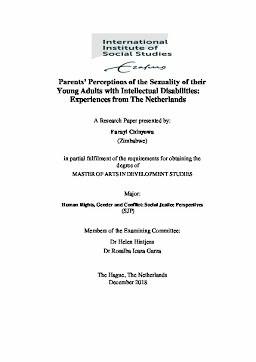 This study explores perceptions and experiences of parents in negotiating around the sexuality issues of their young adults with disabilities. Focusing on parents of those with intellectual disabilities, the study aimed to establish the views of parents and their parental practices regarding the sexuality of their adult children. Fieldwork mainly consisted of qualitative methods, including interviews with eight parents, from a range of different cultural and family backgrounds. Alongside interviews, one focus group discussion with three parents helped to encourage parents to identify shared and distinctive experiences. A key informant who provides psycho-social support for parents of young adults with disabilities, in a professional capacity, was also interviewed. The main findings of the study were the variations in parents’ experiences and what disability means to them in terms of the sexuality of their adult children. Some parents expressed the belief that their children did not have the capacity to engage in sexual relations in a meaningful way. Mothers took the main responsibility for caring, for discussion and for parental guidance. Of eights informants, seven were women. For a few parents, discussion of sexuality posed no problems, and they accepted their adult children as beings able to have sexual partnerships. However, for some parents it was clear that these issues had rarely been discussed with anyone else, including with their disabled adult children. For some of these parents, cultural and religious obstacles seemed to be a challenge. The study identified a need for more informed support for parents in negotiating their young adults’ sexuality, in the case of intellectual disabilities. Parenting intellectually challenges young adults is a unique process for each parent. They have varied situations and experiences that present enduring dilemmas.